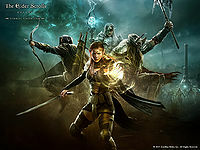 Tamriel Unlimited was a rebranding of The Elder Scrolls Online coinciding with a change in the payment model for the game, beginning on PC/Mac on March 17, 2015, and on PS4/Xbox One with console release on June 9, 2015. Rather than requiring both a purchase of the game and a monthly subscription fee, the only required payment is the initial price for the game itself. This initial purchase gives full access to what has been referred to as the "base" game: all content released up to and including Update 6. Players have the option of continuing to pay monthly for a premium account called ESO Plus, which will provide monthly stipends of in-game currency (called Crowns), boosts to crafting, and access to all DLC while your membership is active. If you do not wish to pay a monthly fee, you can also buy DLC individually. Coinciding with the release of Tamriel Unlimited, the Crown Store was introduced, an in-game cash shop selling "cosmetic and convenience" items. All existing PC/Mac players were automatically switched over to the Tamriel Unlimited payment model on March 17; any remaining subscription time was converted to ESO Plus, even if players chose to cancel their ESO Plus membership rather than renewing it after time runs out. Complimentary Crowns were awarded based on how long they had previously been subscribed. The ESO Subscriber Loyalty Program was discontinued following the release of Tamriel Unlimited. Following the launch of the Gold Edition in September 2016 and the One Tamriel update in October 2016, "Tamriel Unlimited" was removed from the game's branding. This page was last modified on 24 December 2018, at 23:11.